Olimp Glutamine Xplode is a combination of L-glutamine with two amino acids, vitamins and selenium. The supplement stimulates post-workout recovery and muscle growth and has anticatabolic potential. The combination of amino acids with vitamins promotes the synthesis of muscle proteins and production of glutathione, i.e. a natural antioxidant. L-Glutamine – an amino acid which functions as a cellular donor of nitrogen. It accounts for 60% of amino acids in skeletal muscles. By creating a positive nitrogen balance, L-glutamine promotes muscle anabolism and prevents catabolic processes which lead to a decrease in muscle mass. Furthermore, it stimulates post-workout release of growth hormone which speeds up muscle protein synthesis (MPS) and helps build muscles. This amino acid has been also shown to reduce delayed onset muscle soreness after a workout and promote tissue repair and recovery. Along with carbohydrates, it quickly replenishes muscle glycogen stores. L-Leucine – one of the branched-chain amino acids (BCAAs) which is the most potent stimulator of MPS. It accelerates muscle recovery and reduces damage caused by training, thereby helping you increase strength and muscle gains. In addition, it increases glucose uptake by skeletal muscles, allowing you to train harder and replenish your muscle glycogen stores. L-Cysteine – belongs to sulphur-containing amino acids and is a potent antioxidant, promoting the excretion of heavy metals from the body. Along with glutamine, it is involved in the production of glutathione – a antioxidant found in almost every body cell. Because of that, it helps repair tissue damage and remove excessive free radicals, thereby enabling you to maintain homeostasis. L-Cysteine contributes also to the formation of proteins and maintenance of nitrogen balance and has a beneficial impact on recovery and muscle anabolism by reducing cortisol and lactic acid levels. Vitamin C – a water-soluble vitamin which functions therefore as a powerful antioxidant. It takes part e.g. in the synthesis of proteins and collagen, is involved in the metabolism of iron and promotes the synthesis of heme which contributes to normal oxygen transport in the body. In addition, it may prevent the conversion of cysteine into cystine and thus increase its availability and glutathione production. Selenium – has antioxidant, anti-inflammatory and anti-ageing properties. The element is required for healthy thyroid function and boosts levels of insulin-like growth factor 1 (IGF-1), i.e. a hormone stimulating MPS and muscle anabolism. Along with cysteine, it participates also in enzymatic reactions of glutathione peroxidase, protecting the body from peroxides which are formed in biochemical processes and generate free radicals. Niacin (vitamin B3) – participates in the synthesis of nicotinamide adenine dinucleotide (NADH) which is involved in cellular respiration and energy production. The vitamin prevents DNA damage, boosts energy levels and supports brain function. Vitamin B6 – involved in the synthesis of neurotransmitters, hormones and muscle proteins. It contributes to increasing the availability of glutamine because it takes part in its uptake from the gastrointestinal tract. In addition, it is responsible for converting methionine into cysteine and metabolism of vitamin B3. Folic acid (vitamin B9) – required for optimal body growth and cysteine utilisation. It takes part in protein synthesis and methylation, critical to many biochemical reactions, including DNA and RNA synthesis, gene activation, detox and etc. Vitamin B12 – supports methylation which helps recycle homocysteine, i.e. a toxic product of cysteine metabolism. It is also involved in the production of red blood cells, which are critical to efficient oxygen transport in the body. 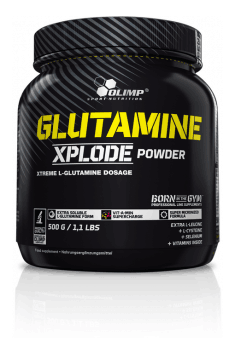 To sum up, Olimp Glutamine Xplode is a dietary supplement which aids post-workout recovery and helps build muscle mass. It contributes to creating a positive nitrogen balance and reducing muscle pain. It is enriched with vitamins and minerals which are required for normal biochemical processes, responsible for the synthesis of proteins and elimination of excessive free radicals. Dissolve 1 portion (10 g of powder – 20 units = 1/2 scoop or 1 tablespoon) in 200 ml of water and drink 2 times a day – before breakfast, after training or before sleep. Use immediately after preparation. Acceptable sediment generation does not influence the product quality. On non-workout days you may skip taking the preparation. The preparation is directed to people who want to increase immunity, decrease the feeling of fatigue and also facilitate building muscle mass and minimize catabolic processes in the organism. Moreover, the preparation demonstrates strong antioxidant properties. Training people should take 5 g in case their body mass is 70-80 kg, up to 8 g when they weigh 80-90 kg, while people above 90 kg should take even higher doses. In order to generally improve health, the dose of 2 g of glutamine a day (2 capsules) is recommended. Thickeners - gum arabic, xanthan gum, sodium carboxymethylcellulose; acidity regulators - citric acid, sodium citrate; fragrances; sweeteners - acesulfame K, sucralose, cyclamates; citrus bioflavonoids, colors: riboflavin (for lemon flavor); beta-carotene, carmine, riboflavin (for orange flavor).